I love a good birthday celebration. My mom always made birthdays special. She is a good “birthdayer”! We got to pick out our favorite dish for supper and our cake! This past weekend we celebrated our grandson’s 10th birthday. I watched this special young man play baseball and have fun with friends. All grandmothers think this way, but he grows so much between visits. Ten years! I love to look into his eyes when he is telling me what all is going on in his life. He always gives away secrets about his sister’s boyfriends. Since she is eight, I haven’t started fretting over that yet. His world is a journey of adventures. We went shopping for a new rod for his upcoming fishing trip and I watched his sparkling eyes when he gave me details of his lures he uses to fish. We looked at every pole in the sporting goods store, and the ones I liked were not even close to what he needed. I thought they were pretty! He would roll his eyes. “Gigi, you don’t buy them because they are pretty!” Who knew?! He has passed from child to young man. The passing of ten years went too fast for me, so I am grateful that he still loves to spend time with us. I learn so much from him. Ten-year-olds are pretty wise! Birthdays and the celebration times create beautiful memories. I pray each of us will always make those days special for the people in our lives. The extra effort is always worth it. You are never too old to have birthday parties! Just add a cake and candles, and the fun begins! Find this party-worthy recipe for Chef Sarah Simmons birthday cake pictured above on the Bake From Scratch website. 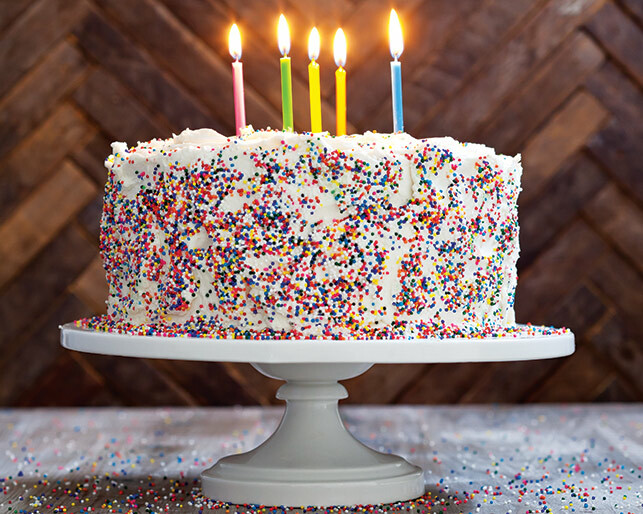 What’s your fondest memory of birthday celebrations past or your go-to birthday cake? 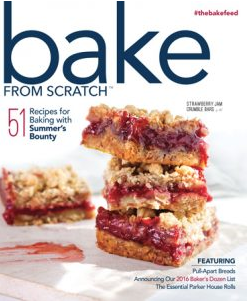 Find more amazing recipes in this issue of Bake from Scratch! My twin sister and I always had a fun birthday. We usually had a cream cake with pineapple in the middle. Later it was pudding filling. Our parents always saw to it that our birthday was special. Our dad would have a bouquet of gladioli sent to the house. My twin sister always a had a birthday party. We would invite all of our friends. We would never had a vanilla cake. because I am allergic to chocolate and nuts,too. One time it was so hot the cake started to melt. My father went outside and invited a lot of the neighbors to come in and have a piece of the melting cake. On my birthday I always had a cream cake with pineapple filling. Around the edge of the cream cake were chopped bits of almonds. In those days we always had milk and no soda. My parents always made my birthdays special. beautiful memories. I have a ten year old grandson too. I can make german cake frosting. like walnuts. I love celebrating birthdays! When I was a kid at home Mom always let us choose our supper menu. Since my birthday is near the end of July, there was fresh garden produce. My choice was the same every year. Fried chicken (Mom made the best ever! ), mashed potatoes and gravy, Fordhook limas (fresh from the garden) and sliced tomatoes, just picked. I never requested a cake. My choice was fresh blackberry cobbler or pie. Most years I even picked the blackberries . Some years my younger sisters still make a blackberry pie for me. But you can bet they don’t brave the thorns, hot sun and snakes to pick them!! My twin sister and I loved the doll cakes that our grandmother and one of her square dancing lady friends would create for us. One cake would have a blue ruffled icing skirt and the other had red or pink. We felt so special. Great memories! I love the idea of baking a burthday cake for Jesus!! Thank you!! My mother made my sister & I beautiful doll cakes while we were growing up. Those cakes had an actual doll in the middle and the cake was the doll’s full-skirted dress. The cakes were amazing! On my 12th birthday I wanted something different for my birthday cake…..chocolate Whoopie pie’s! While in college, to celebrate my 21st birthday, my mother brought champagne and chocolate Whoopie pie’s to my dorm. My roommates loved it but I think it was the “non-stop champagne” that made the whoopie pies even better than usual!! To this day, my 91 year old mother still makes chocolate whoopie pie’s for my birthday cake! I think she has a hidden agenda though …… she loves Whoopie pies too!!! By far my favorite cake to make every year is the one I make for Jesus on Christmas Eve. bring a special Birthday Cake and share my tradition with who ever we were with. for that special cake to make for this year, have you got one? ps; Happy Birthday to all your friends celebrating their Birthday this special year 2018! Well the cake is easy. Without question the all time favorite is German Chocolate Cake with LOTS of Coconut Pecan Frosting. None of that chocolate frosting stuff some people are putting on it. The worst thing is 12 years ago…..diagnosed as Celiac. I MUST eat gluten free. I have no choice in life. Well I do, if I want to bring back up my dinner every night after eating I could AND an extremely high risk of stomach cancer I could ignore it but as I don’t want either, I do my best to listen. I STILL can’t adjust to it. And I have YET to have any gf German Chocolate cake tasting as good as the regular cake. As a kid woman would make sickening sweet frosting with enough powdered sugar for instant diabetes. I’ve never been a big “sweets” or candy person. Back in the early 60s those cans of Duncan Hines, Pillsbury and Betty Crocker premade frosting were not on shelves yet. Personally I think its pretty good stuff. I would scrape off the frosting and just eat the cake at family birthday celebrations which were ALWAYS on Sunday closest to the actual birthday right after church, Sunday Luncheon. Everyone got the same meal, a special “fried” chicken dinner (fried in shortening in cast iron skillets) but not deep fried like most people think of. While at church the women placed the chicken in big covered roasters with a bit of water and roast it low and slow on about 300. The best part about the meal is the gravy. Oh my heavens, all the crispy bits and pieces that worked their way in the gravy from the skillet. Of course it was served with lovely mashed potatoes. Sides would change based on the time of year but was often corn or lima beans and so forth. What the person wanted. Of course there was a cake. My great-grandmother had a miniature tiered cake set which must have been ordered from some box or container. I STILL have the original cardboard box it arrived in. The largest cake was a 10-inch tier, the bottom, the next was 7-inches and the top their was a 4-inch tier. Even though we had our family birthday dinner, Memaw would also make me another tier cake on my actual day of my birthday to have a “birthday party” with my dolls around my child’s kitchen table. It was convenient, we lived right next door until I was about 6 or 7. I was very close to my Memaw, my great-grandmother who became my babysitter when I was 8 months old when my mom went to work fulltime. This was very unusual at the time. Well Memaw began noticing how I would always scrape the frosting off the cake. The next birthday (which happens to be in 9 days by the way on the 29th, also my parent’s wedding anniversary. 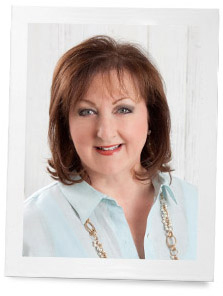 yes, I was born on my parent’s 1st anniversary, talk about timing, but I was born about 48 hours before someone named Lady Diana Spencer was born…..Her birthday is July 1st, same year. I am approximately 48 hours older than Princess Diana, definitely a big part of why I followed her and now her sons’ lives) Memaw introduces me to the German Chocolate Cake. That was it, I was hooked. I always did love coconut and pecans so it was perfect for me. If its not this cake then its an Angel Food Cake. I was very fortunate that I had an elderly lady, not related by family, who also made this cake for a fair number of my birthdays ON the actual day. Dora always did one for my great-grandfather on his birthday, August 7th as he mowed her lawn and did outside work for her. Dora Hartle, who at least looked thin and frail, I don’t think she actually was though (she always reminded me of the Baldwin sisters on The Walton”s show, remember that? She could have been a 3rd sister. She STILL drove an early 1940s old Ford or Chevrolet car). Anyway, she used to always make a homemade from scratch angel food cake for my Nanny, my great-grandfather and she discovered I LOVED it. It was a thank you for the yard work and things he did for her as she lived alone. I would imagine Nanny told her how much I loved it, may have even told her about my dislike of most cake frostings at that time. So…she began delivering one to me on my birthday. Not anyone else in the family, just us two. One year when home from college at Christmas my great aunt Zelda (my great-grandparent’s youngest daughter and the one who stayed home and cared for them. Memaw had passed away suddenly with a massive stroke when I was 13) was going to a nursing homes to make lots of visits taking cookies and and various small gifts to lots of seniors. She asked if I wanted to go along so I did. Oh I felt SO badly for Dora. It was the least nice home in the county. It was AWFUL. (One reason my family has NEVER placed anyone in a nursing home, my mother just retired last fall at age 75 from working on call at a nursing home, oh the horror stories I’ve heard). Had I been older and more settled I believe I would have tried to bring her home with me. But yet, she seemed so happy and chipper even in the misery of the quality of life, or the lack of it, she had now in life. Despite all of that she was STILL as cheerful and as happy as could be. She was in her 90s now. One of the last things we spoke of that day she said she only really had one wish left, she wanted to live until her next birthday. I wasn’t sure why, she never did say. However she said, on her next birthday she would be 94 years old. She never wanted to die an odd number, she wanted to live that long. To wind this up she DID live until her next birthday, I believe it may have been in February. She did turn 94 and I think it was only weeks later she did pass away. I’m sure my aunt Zelda let me know. But as Dora really didn’t have any family that I ever knew about there wasn’t even anyone to send a sympathy card to. However it was good to know that people DID still think of her and remembered her. They say a person is never truly good as long as someone remembers them. I know I’ll always remember her and the small but oh so VERY special thing she did for many of my childhood birthdays. I was happy for her, she was able to be her “even” number when she died. I have NO idea why it was important to her. But that dear woman continued bringing me homemade angel food cake until she went in that despicable nursing home. I wish I had been older and understood more. There might have been a way it could have been prevented. But she seemed not to seem to mind it surprisingly. I don’t believe she ever married or had children. If ONLY more people would be like her. This was one of the nice things of growing up in a small town. You know, that makes me think of something. I think next weekend, around MY birthday, not hers, I’m going to track down in the cemetery, very close to where I live and work, where she is located and put flowers on HER grave as a thank you for those angel food cakes, both for me and for my great-grandfather. I’m sure if Nanny knows he would be very happy to be included in the thank you. It’s a shame our small town has changed SO much. My dad was born in 1939, and during his childhood their family knew who lived in EVERY home in town. He’s always said, it wasn’t worth trying to ever get away with anything. Before anyone could run home someone would have been sure to have called the house and “tattled” about what had happened and what had been done. It was just easier to do the right thing. Now….people are lucky if they even have a clue who is living next door. What a shame. Oh, a p.s. in a way….as soon as I saw this cake with the multi-color sprinkles it reminded me of a BEAUTIFUL cake from the blog sites, Sprinklebakes.com. For anyone who wants ideas for AMAZING birthday cakes, not going through all the decorating with the gumpaste and fondant and carving and all the work you see people like Duff Goldman doing, but basic 2 or 3 layers in a tiered cake like this one, but yet with wonderful decorating ideas I’ve never seen any other place, but yet with a big WOW factor, check out this site. When I saw this “sprinkle” cake I wondered if this is where you got the idea to do this one. Not all adults would like a cake completely covered with sprinkles, I would, but my dad wouldn’t. There are so many wonderful cakes there. If I could post a picture I would add a few but comments won’t allow pictures. This would be a good person for you to interview one day, asking her how she is able to IMAGINE all the amazing desserts she does in her little gray cells. So to any fellow June birthday babies celebrating this month, get out any pearls and roses, there actually not near the number of June birthdays as there are in some other months, nothing like March and September. I’ve always thought, except for one reason, June was the BEST month for a birthday. It’s halfway through the year. For me its almost exactly 6 months till Christmas. I always feel sorry for people who have birthdays in December or January or right around Easter or all these other holidays. I used to babysit a little girl born on the 4th of July. The Baltimore suburb Towson always has a big parade. Every year, she was still very young, she thought that parade was for HER birthday. I left before she got much older so I never knew, but I always wondered how upset was she when she learned that big parade wasn’t for HER birthday but for the nation? However June is warm, but not too hot, its pretty. It’s just PERFECT for birthday and birthday parties. But for ONE thing……At least for me, being at the end, I was never able to celebrate my birthday in school with my classmates having my mom bring cupcakes for everyone. Oh how I dearly wanted that. I did have a few parties but I NEVER got that party in school. So be happy for your grandson’s June birthday. I personally think its the BEST month of the entire year in which to have one. Somehow it just feels special and so is he I bet. For my youngest daughter’s 8th birthday party, my beloved sister and I planned a lovely tea party. We moved the picnic table out under the trees, dressed it with linen and china and handwrote beautiful menus for each girl. The activities were sitting on blankets in the shade and stringing necklaces for themselves and trimming straw hats for themselves and their teddy bear favors. The menus included peanut butter and jelly sandwiches, carrot coins and the like, ending with ice cream and cake. My sister and I pretended to be waitresses and served the little girls, who were all in party dresses and Mary Janes. One girl, Esther Grace, looked her menu over carefully and then said, to my sister, “I believe I’ll just have the ice cream and cake please.” Although we had to move away from the table to cover our laughs, I later thought about it. Esther Grace probably had it right: when in doubt, always have the ice cream and cake! My favorite cake is the Black Midnight Cake from my mom’s 1961 Betty Crocker Cookbook. It’s the most delicious deep chocolatey cake and each year I got to pick the color of the vanilla frosting that went on top. The best one was when my brother made it for me with green frosting and yellow lettering. The frosting was bright but against the dark cake inside it was strikingly beautiful. My favorite birthday was the year my husband took me to visit my best friend in Nashville. We went to the Picnic Cafe and ordered their coconut cake. I’ve never come across one that was as good as their cake since then. When we flew home I took several slices through the screening at the airport and the agent there knew it was from the Picnic Cafe by sight. He teased me with a wink that he might have to confiscate a piece. One year Mom & I went to Colonial Williamsburg for my birthday. We had dinner at the King’s Arms Tavern on a beautiful evening. I had Planter’s Punch, Peanut Soup & Roasted Chicken with vegetables. It was really a special night & a very memorable birthday celebration . My mother always made everybody’s favourite cake for their birthday. Mine was a walnut torte with coffee buttercream and my brother’s was a caramel torte made of delicate , flaky cake layers. Both were a lot of work,but my mom made them with much care and love every year until she developed altzheimers. I thought I would never have one of her cakes again, but my dear Godmother has taken over that duty and I still get my favourite birthday cake every year! My father’s favourite cake was chocolate marble Duncan Hines!! After all that work with the tortes, my mom got a break with my dad’s easy to make birthday cake. What great memories we all have of those special days. My mother always made a three layer white cake with seven minute frosting and flowers. I always looked forward to the pretty cake and having family over for family birthdays. How fun! My birthday is in 3 days and I always loved it when I was a little girl because school was out and the party was at the pool! However, my tenth birthday I had a broken arm in a cast so I sat on the side of the pool while my friends swam! I love the Birthday cake Sarah Simmons made, I think I’ll show it to my hubby and give hime a hint! I loved the mincemeat cake that Mother made for me – moist!! If there was any left a couple of days later, a slice toasted and buttered with a cup of tea was a wonderful treat. And, less we forget, scrumptious Chess and Lemon pies make wonderful birthday cakes! My sister and I gave our Mother a surprise birthday party….we were 10 and 12. We invited the neighbors and her bridge club. We were southern enough to set up card tables with table cloths ,silver, china, and her very best crystal . We couldn’t quite figure out the food so we went to different neighbor ladies with a can of tuna and an angel food cake mix. They laughed and then they helped with lunch. I am certain we had flowers . We were really good with little flower arrangements from the yard. Our Mother worked in the mornings at the college creamery so on the day of her birthday we called and had her bring home sherbet . She was quiet surprised to come home to a house full of Ladies and a birthday party….it was the best party we ever gave!!! I still think of it on June 21.